International ISP, Pacnet, has paired with Pacific Fibre to build a $US400 million fibre link between Australia, New Zealand and the US. The companies are touting it as a “city-to-city, low latency subsea fibre optic cable”. 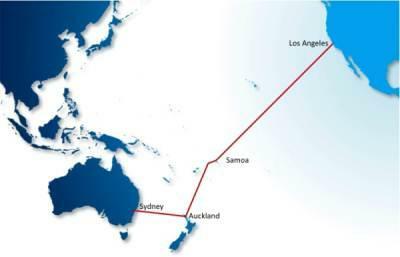 Due to be completed by 2013, the carrier neutral cable will span 13,600km, landing in Sydney, Auckland and Los Angeles. It will have at least two fibre pairs with 64 wavelengths each and 40Gbps per wavelength technology. Capacity is tipped at 5.12 terabits per second (Tbps), more than doubling that of wholesale broadband service provider Pipe Networks' 1.92Tbps PPC-1 Sydney to Guam submarine cable. This can be upgraded to 12Tbps with future 100Gbps per wavelength technology. There are currently only five major Asia to US cables, including the PPC-1 and the Southern Cross link which Optus partially owns. Pacnet CEO, Bill Barney, said it will have more affect on the Australian broadband market than the National Broadband Network (NBN) by alleviating International traffic bottlenecks and latency. The objective is to bring down the cost of purchasing capacity from the US for Australian and New Zealand retail ISPs so they can offer cheap unlimited bandwidth plans comparable to those offered in other countries such as the US, Japan and South Korea. “It’s not just having access to the US but having access to all markets and what you will see with the cable is by getting to the US, you can access all markets,” Barney said. Pacnet and Pacific Fibre will start looking hunting for suppliers in September. They are looking for 4-5 suppliers from the line-up of usual suspects such as Alcatel-Lucent, Fujitsu, NEC and Huawei. Pacific Fibre was formed by a group of Australian and New Zealand businessmen that wanted to push for a new international fibre link to boost broadband capacity Australasia.